Heinrich Schütz made his second visit to Venice in 1628. On his first visit, lasting around three years, he studied with Giovanni Gabrieli. His second visit was made partly to escape the depredations of the Thirty Years War but also to catch up on musical developments now that Monteverdi had replaced Gabrieli at St. Marks. Whilst there, he published his Symphoniae Sacrae I in 1629, the first of what would eventually be three volumes. This first volume of sacred concertos was dedicated to his teacher Giovanni Gabrieli and sets Latin texts. Symphoniae Sacrae II would not be published until 1647, by which time the Thirty Years War was nearing its end. 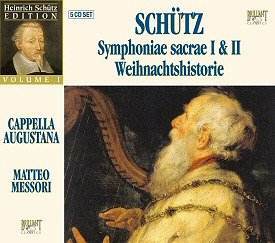 On this set, enticingly billed as volume 1 of a Heinrich Schütz edition, Cappella Augustana under Matteo Messori perform Symphoniae Sacrae I, Symphoniae Sacrae II and Weihnachtshistorie, the Christmas Story written after he had retired from his post in Dresden. The Symphoniae Sacrae are sets of vocal concertos, settings of sacred texts for one or two vocal soloists and a group of instrumentalists. In the first set, the texts are all Latin and are taken principally from the Psalms and the Song of Solomon. The group perform the concertos in order which means that we start with works for single voice and instruments and work gradually up to the multi-voice works. This has the advantage of clarity, but means that the 2 CDs that make up Symphoniae Sacrae I can lack variety. This is partly because the work was not intended to be listened to in one sitting, it was essentially a compendium to be mined for works. Only someone like a CD reviewer would ever need to listen to these works end to end. But, if you do so the result is a wonderful experience. Though owing a debt to Gabrieli in these works, Schütz also hints at influences such as Monteverdi. Essentially these are marvellous chamber pieces and that is how Cappella Augustana play them. They call for virtuoso performances from both singers and players. Messori has gathered a fine group of instrumentalists for whom the individual solo lines hold no fears. The singers also perform highly creditably and the whole ensemble is responsive as a group. But, whilst never less than satisfactory, not all the vocal performances are on the highest level. The most problematic performances come from Krzysztof Szmyt and Robert Pozarski, who are billed as tenors and tenori alti. This is Messori�s solution to the problem of the tenor/alto parts, capable of being sung by a high tenor or a counter-tenor. The modern counter-tenor is an anachronism in this repertoire and Messori is to be commended for using high tenors. But Krysztof Szmyt, in �In te, Domine, speravi� and �Cantabo Domino in vita mea�, displays a weak falsetto register and fails to integrate his registers, to disturbing effect. His passagework is also a little smudged, a failing that is also displayed by soprano Marzena Lubaszka in �Paratum cor meum�. Bass Harry van der Kamp, displays a wonderfully dark, even gravelly voice and his performances in �Jubilato Deo omnis terra� and �Fili mi Absalon� are some of the highlights of the discs; this latter opens with a wonderfully sombre ritornello involving four trombones. This same dark texture is reproduced in �Attendite, popule meus legem meam�. The first duet in the set �Anima mea liquefacta est� with its fiffare obbligati, comes as a welcome contrast to the solo movements. Here the two tenors Krzysztof Szmyt and Robert Pozarski are in more comfortable territory, both the duet and its second part �Adjuro vos, filiae Hierusalm� are lovely. �Benedicam Cominum in omni tempore� is a lively piece for a trio of voices (soprano, tenor, bass) and cornet. Its second part, �Exquisivi Dominum et exaudivit me� uses the same forces and it is to the group�s credit that each piece uses an entirely different permutation of performers with nicely balanced and admirable results. �Domine, labia mea aperies� opens with a lively duet for cornet (Jean-Pierre Canihac) and trombone (Mauro Morini). The vocal sections provide some lovely reflective music for Marzena Lubaszka and Krzysztof Szmyt, but again the faster sections are marred by poor passage work. In �In lectolo per noctes quem diligent anima mea quaesivi� the texture created by the three dulcian players is most evocative, but the voices (Anna Mikolajczyk and Robert Pozarski) do not quite match the instrumental standard, perhaps because Pozarski seems to find the high tenor tessitura a little uncomfortable. In terms of the number of parts, �Veni, dilecte mi, in hortum meum� is the most complex piece on the disc. Written for two pairs of duetting voices (Marzena Lubaszka and Krzysztof Szmyt, Anna Mikolajczyk and Robert Pozarski), with trombone and dulcian obbligato, one pair of voices acts as an evocative echo type chorus, singing purely with continuo accompaniment. Written eighteen years after the first set, Symphoniae Sacrae II does not show the same experimentalism in the scoring as set I; all but one are written simply for strings and continuo. Though Schütz�s way with violins is many and varied, he does not use them in a standardised way; they are very much part of the contrapuntal texture of the pieces. The other major change is that these concertos are in German with texts taken principally from the Psalms but with other passages from the Bible and even the inclusion of texts by German theologians such as Martin Luther. The vocal lines do not lack virtuosity, far from it; but Schütz has employed elaborate ornament in tandem coupled to a rather plainer vocal line to give clarity to the text; text is very often paramount in Schütz�s German works. Some of these set quite long texts, far longer than any of the Latin set and for them Schütz creates some fascinating multi-movement works. The singers in Cappella Augustana seem to be more at home stylistically in these later, German pieces. Again, Cappella Augustana perform them as published, starting with works for solo voice, so the set opens with a lovely group of seven concerti for soprano solo which are shared between Mikolajczyk and Lubaszka. Both sopranos have a bright sound and contribute some fine ornaments; though singing with a lovely line they both convey the text well. The opening of the German magnificat �Mein Seele erhebt den Herren� is a lovely moment and is almost Monteverdian in feeling. With the addition of recorders, this concerto is the only one using extra instrumentation. Following the soprano group, the alto Piotr Lykowski is introduced in a concerto, �Herzlich lieb hab ich dich, o Herr�. Though billed as an alto, Lykowski�s vocal line is another of the alto/high tenor ones and he sings it with an attractive enough, soft grained voice. His performance is OK as far as it goes but lacks something in intensity. Both the tenors contribute a solo concerto with Pozarski�s �Frohlocket mit Händen und jauchzet dem Herren� sounding dutiful rather than joyous and Pozarski seems to be forcing his voice in the lower registers. �Lobet den Herrn in seinem Heligtum� is a lovely work but unfortunately Szmyt�s passagework is a little uncomfortable. The solo concertos conclude with a fine pair sung with style by van der Kamp. The duet concertos start with a group of lovely ones for the two sopranos who blend beautifully. This group finishes with the delightful, dance-like �Es steh Gott auf�. There follows further duets for a variety of combinations, soprano and tenor, soprano and bass, two tenors, tenor and bass. The duets for the two tenors display the same limited qualities as their solo movements. Bass Bodgan Makal and tenor Robert Pozarski do smudge their ornaments in their duets and Pozarski can sound uneasy, but they respond well to the wonderfully dark texture that Schütz creates. The final group consists of five trios. The first, �Lobet den Herrn Alle Heiden� is a vigorous piece sung by Lykowski, Szmyt and Makal. The second trio, also for alto, tenor and bass, is sung by Lykowski, Szmyt and van der Kamp. Unfortunately in both these works Lykowski is a little weak and the passage-work can be fuzzy, but this does not really mar what is a fine pair of works. �Drei schöne Dinge seind� is a long setting of various biblical texts given an impressively sombre performance by Szmyt and Pozarski. The concertos finish with a final pair, �Von Gott will ich nicht lassen� for two sopranos and bass and �Freuet euch des Herren, ihr Gerechten�. �Von Gott will ich nicht lassen� is a setting of a long devotional poem by Ludwg Helmbold and the final concerto is a short joyous setting of verses from Psalm 33. In all the concertos in this set, the performances of alto and tenors never seem to be quite bravura enough particularly when it comes to ornaments; after all these were works that were written to be sung by virtuoso singers. The concluding work is the Christmas Story. This sets a collation of texts, from St. Luke and St. Matthew, centred on the birth of Christ. Schütz wrote it after his retirement from court, but it was written at the express desire of the Elector. The work alternates recitatives with arias (concertos) with instrumental obbligatos, the texts for the arias being based on the biblical text. The result is a very immediate and rather modern work. The version recorded here is one from 1664 that was authorised (though not actually supervised) by the composer which omits the concerti con l�organo. Cappella Augustana�s version is perhaps not one which would be a library choice, but they give a fine performance. Krzysztof Szmyt as the Evangelist takes the lion�s share of the recitative. He makes a dramatic Evangelist with a good feel for the text but I would have liked his voice to be more mellifluous. The remaining personnel combine nicely for the various ensemble numbers and the work receives quite a dramatic performance.